How to get pulled over by the police and not end up on the news. Posted in Defensive Driving Blog | Comments Off on How to get pulled over by the police and not end up on the news. It seems like the news has a horrible story of a simple “traffic stop” going horribly wrong almost weekly. Although every situation you have heard about was different in the beginning, the ending has been tragic in some situations and a better solution would be to know how to act when being pulled over. Getting pulled over is easier than you may think. So what do you do if you are getting pulled over? Experts say that as soon as you see the police officer’s flashing lights or hear the car’s siren, turn on your own emergency flashers. This will inform other drivers that you are the driver who is being pulled over and alert them that you will be slowing down in preparation to pull over. Search for a safe location to park your car. Remember that the police car will be parked behind you, so find a place that is large enough for two vehicles. Also get over enough so that the police officer can stand next to your car with the least amount of exposure to oncoming traffic. If you are on an interstate or highway, there is usually an adequate amount of space on the right side of the road for you to pull over there. Never pull over on the left side of the road, even if there is a median. If there is a driveway or business parking lot within a very short distance, most police officers find it acceptable for you to slowly drive to such a location before stopping your vehicle. Make sure to communicate your intentions to the officer. You may have to turn the flasher off long enough to signal your intentions to the police officer. As soon as you have found a place to pull over and park your car, turn off the ignition. Never do anything that the police officer might interpret as an intention to get away, no matter how minor your alleged traffic infraction might be. 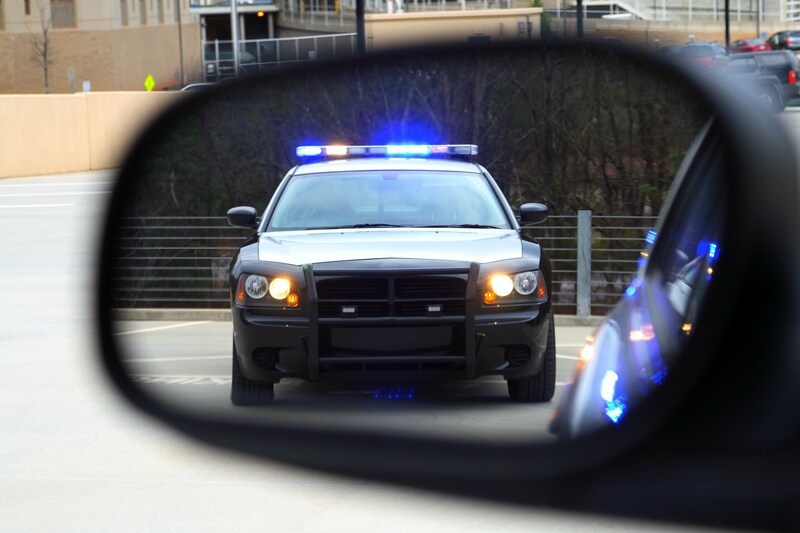 If it is night time, turn on your interior dome light so the officer can see inside the car and what you are doing. Immediately roll down your window if you have been pulled over by a marked police car. If you have been pulled over by an unmarked police car, wait until the officer emerges from the vehicle and you can see his credentials before rolling down your window. It may take several moments for the police office to exit his patrol car. This is normal. He or she may need to communicate with the police station to inform them that a vehicle has been stopped or the police officer may be getting information about your car from your license plate. Be patient. Do not get out of your vehicle at this time. 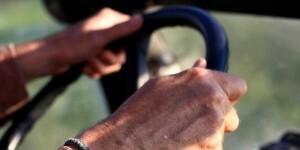 Keep your hands in plain sight on the steering wheel. Positions of 10:00 o’clock and 2:00 o’clock on the steering wheel is located towards the top of the wheel and better than the lower half of the wheel. When you first begin to initiate conversation with the police officer, remain calm, polite, and respectful. You do not know what situation the officer may have been in before pulling you over. It may have been a life or death situation for them. If you find that you are emotional, try to control your feelings so that the officer can speak with you about the reason he pulled you over. If you are unsure of the reason you were targeted, do not become defensive. The police officer will give you a detailed description of the reason or reasons they have for pulling you over. The police officer will most likely ask you for your driver’s license and a copy of your vehicle’s insurance policy. Most people keep their insurance card in their glove compartment. Quickly gather these documents and give them to the police officer. If you do not have one of them, tell the officer and give him an explanation for the missing information. IF YOU HAVE AN OPEN WEAPON OR CONCEALED CARRY LICENSE AND OR A WEAPON WITH YOU, TELL THE OFFICER BEFORE YOU REACH FOR ANYTHING. Be apologetic. No police officer wants to hear a sob story. It is also a bad idea to refute his or her allegations. If you were speeding, insure the officer that you understand the consequences of driving over the speed limit and that you will slow down immediately. If the police officer wants to give you a lengthy lecture about safe driving, listen to it. If the officer issues you a traffic citation, do not argue or beg. If you are only given a warning, thank the officer for understanding. If the officer only gives you a verbal warning, ensure him or her that you appreciate the opportunity to correct your driving mistakes before having anything put on your driving record. Again, be respectful. Even if you are unhappy with your ticket, remember that you could be pulled over by this same officer again in the future. After the officer has returned to his patrol car, turn off the emergency flashers, check for oncoming traffic and when the road is clear, turn on your signal, and safely pull onto the main flow of traffic slowly and continue on your way. While being pulled over by a police officer is by no means a pleasant experience, using common sense and good manners can make it go much smoother than it otherwise might. Be sure to follow the instructions on the traffic citation if you were issued one. Make sure to correct whatever driving mistake caused you to be pulled over in the first place. Of course the absolute BEST way to avoid the whole situation is to not get pulled over AT ALL! The best way not to get pulled over is to obey the laws. By seeing driving behavior from the traffic cop’s point of view, you can avoid encounters with the law. A little extra awareness could help you keep points off your driving record and keep down the cost of your car insurance. Three police agencies and two independent traffic experts loaned their expertise for this list of the most common traffic stops. There were some minor variations in opinion, depending on the police agency. But this list shows you the things to watch out for if you want to avoid getting pulled over by the police. Speeding.This was on everyone’s list, and the reason is simple. The faster you go, the longer it takes to react to an unexpected situation, whether it’s a pedestrian stepping into the street or another car making an unexpected lane change. Braking distances also increase as speed builds, and it takes about 120 feet for a vehicle to stop when it’s traveling 60 mph. Speeding is common among the police officer’s reasons to write tickets, particularly for speeding, in an attempt to control the “mileage death rate” — the number of people who die per freeway mile. That’s a sobering thought. Alex Carroll, author of Beat the Cops, which has sold more than 250,000 copies, offers an opinion on how far over the speed limit a driver can go without being pulled over: 5-7 mph “easy,” he says. The officers interviewed for this story confirmed that there’s a “buffer,” but added that the decision to cut a speeder some slack is up to the officer’s discretion. Equipment violations.Everyone knows the movie scene where a cop smashes a taillight to justify a traffic stop. But in real life, there’s little need for that, our experts say. People commit a multitude of code violations all on their own. Leading the list are heavily tinted windows, burned-out headlights, broken windshields, expired tags, the lack of a front license plate and loud exhaust modifications. Following too closely and improper lane changes.These two are a tie. Both of these violations are forms of hazardous driving that police specifically called out. Following too closely can easily cause accidents by shortening a driver’s reaction time. Combine that with cell phone use or texting and it is a recipe for disaster. An improper lane change means cutting someone off or changing lanes without looking first. Failure to signal can also be added to this ticket but it usually doesn’t initiate the traffic stop — partly because the failure to signal is so common. Say that a police officer uses this time-honored opening line: “Do you know why I stopped you?” Take a minute before you answer, Carroll says. If you admit guilt or name a specific speed that you were driving, your fate is sealed. Instead, respond courteously but remain vague, he advises. However, “If you have clearly done something wrong, and you sit there and you’re evasive with the cops, it’s not necessarily in your best interest,” he says. If you plan on contesting the ticket in court it’s really better to say very little. The officer is expected to have a clear recollection of the traffic stop. A lot of traffic-ticket gotchas — and serious accidents — begin with a frustrated, impatient driver. If you really don’t want a ticket, try chilling out. Put on a relaxing radio station or CD and be patient, because traffic is bad and there will be delays. We do have Fall in Texas! No really, it’s true! Posted in Defensive Driving Blog | Comments Off on We do have Fall in Texas! No really, it’s true! When it comes to parks and refuges in Texas we have more than our fair share. Many are known for great hiking (Colorado Bend State Park, Milton Reimers Ranch Park, Garner State Park and Enchanted Rock, just to name a few), but we came across one renowned for its Fall foliage. Yes, even this year when temperatures have remained high, there will be a Fall and there will be foliage. Want proof? Here’s what you do. And when you get hungry from all that hiking you can hop over to the Lost Maples Café in Utopia (that sums it up!) for what is described as comfort food in an historic old building built in 1904. Just looking at the menu will have you racing for your car keys (and don’t forget their world famous pies!). And if you head to Lost Maples State Natural Area or any other wonderful Texas Park be sure to obey the rules of the road and should you meet one of our fine officers on your trek and need to take defensive driving, just log into WirelessDefensiveDriving.com. We are here for you.